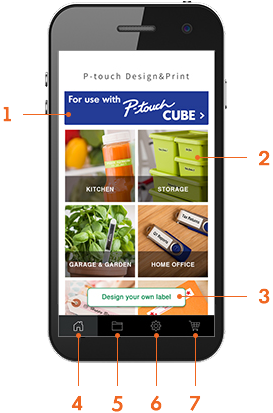 Access settings for your P-touch CUBE. Tap the Design your own label button on the home screen. Tap to add text. Choose your font, tap Done. 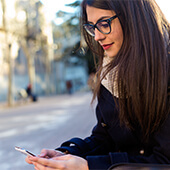 TIP: You can use the voice-to-text feature on your smartphone. Tap your label, tap Text/Sym on the pop-up menu, select Symbol. View symbols by swiping OR tap the green arrow to see symbol categories. Tap a symbol, tap Done. To move a symbol, select the symbol then tap the gray arrows on the pop-up menu. To delete, tap Delete. Tap Frame, view selections by swiping OR tap green arrow to see frame categories. Tap a frame, tap Done. Save your custom label when you're finished so you can reuse it.